Just as beautiful as the ribbons and bows on her presents, these darling earrings will make her heart take flight! Give your gift with confidence knowing they are made entirely of 100% solid 14k yellow gold with AAA-Grade perfect round cultured pearls. Tiny Blessing's complimentary gift wrapping makes every gift giving experience everything you dreamed. The earrings are beautiful, came perfectly wrapped, and arrived super fast!! Love them. Love the earrings. Theyre the perfect size and came perfectly packaged and ready to be gifted! 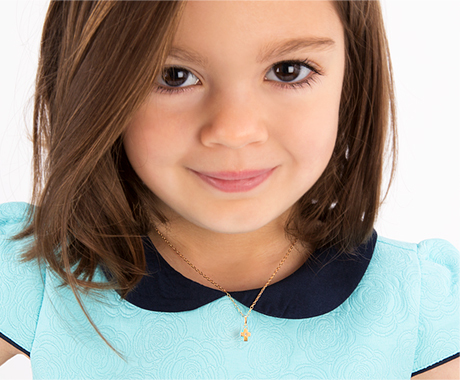 The sweet earrings are perfect for a little lady to be wearing. Appreciated the gift box, storage bag, certificate of authenticity and the polishing cloth. Makes for a very nice presentation. I wasn’t too sure about these on the site, but seeing them in person changed my mind. They are so adorable!